All of my daily possessions currently fit into a pack weighing less than 15 kilograms. Yet, I still relish when we can downsize even further for trekking. We take only the necessities. There are no "what if" items; no vanity toiletries; no extra shoes. We carry just the essentials we need to endure the weather and a day of laundry. With a walk in the woods, it's EAT-HIKE-SLEEP. The simplicity is pure bliss. It was almost two months since we last hit the trails and I didn't realize how much I had missed the routine until our boots were scuffing up dirt and I was huffing and puffing. 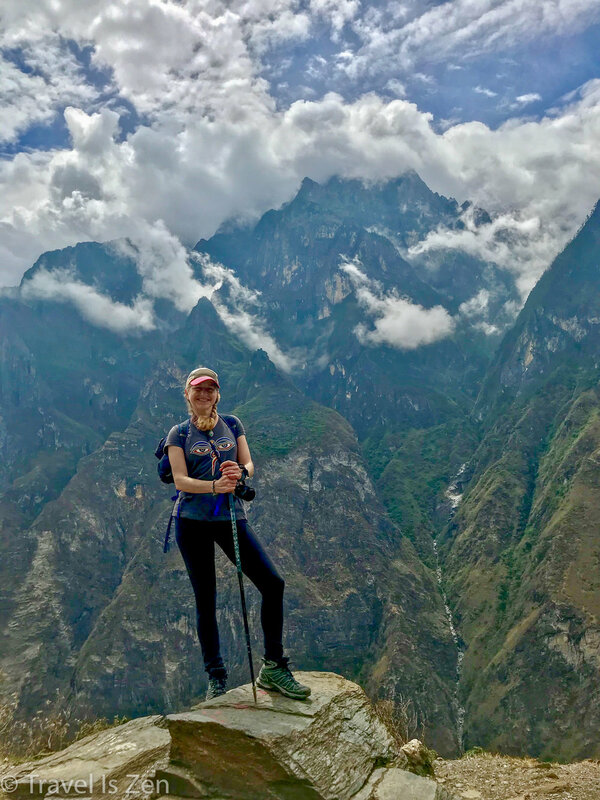 We hiked 21 miles over three days on what is reported to be China's best trek: Tiger Leaping Gorge, in Yunnan Province. The gorge is one of the world's deepest, with the Jinsha River cutting into the earth over 12,000 feet, which is almost twice as deep as the Grand Canyon. 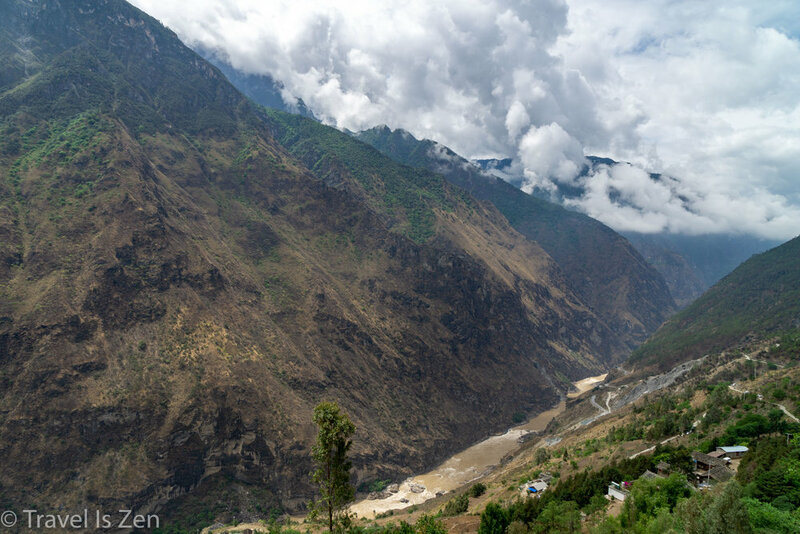 Tiger Leaping Gorge is flanked by Jade Dragon Snow Mountain to the south and Haba Snow Mountain to the north. As their names suggest, they are indeed snowcapped, towering over 17,000 feet into the clouds. The trekking trail is sometimes called the "High Trail" (in contrast with the low trail, which most tour groups traverse via bus). 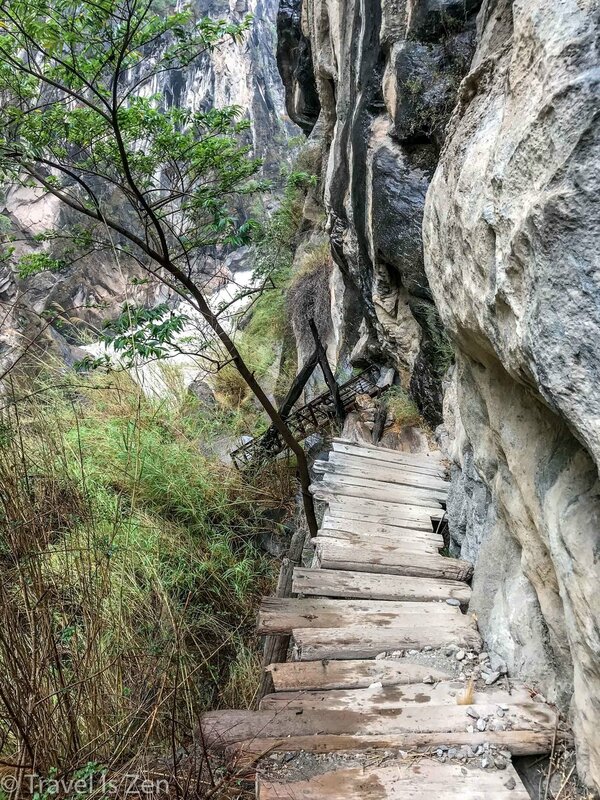 The High Trail starts at the edge of Qiao Tou village and zig-zags along the middle of the mountain on the east side of the gorge for 15 miles to Walnut Village, providing uninterrupted views of the canyon's sheer rock walls and plunging waterfalls. 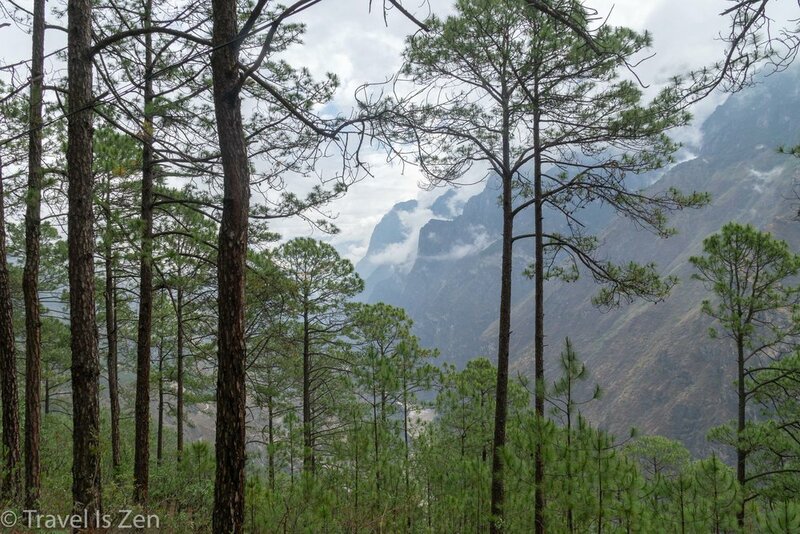 The trail is a mix of dirt path and paved road, with swaying bamboo and tall thin pines. The rainy season in Yunnan Province begins in June, so we were pushing our luck at the end of May. Day one was hot and sunny as we made the initial steep ascent up the mountain. A downpour in the late afternoon was our cue to settle in at Naxi Guest House for the night. The thunderstorm lasted through the night and we awoke on day two to a blanket of fog that completely obscured any view. Feeling a taddy-bit bummed, we slowly ate breakfast and then trudged into the mist. Mother Nature did not disappoint us. Within an hour, we were treated to a spectacular peep show. As the sun warmed the air above and wind currents pushed through the valley below, the fog swirled and thinned, then retreated to the valley floor, giving us a momentary peek at the mountains as it dove. 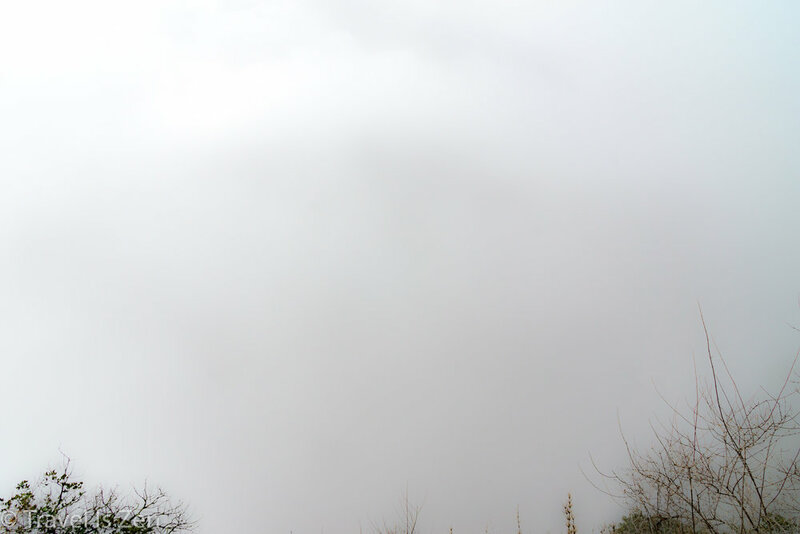 Gathering force, a thick mass of clouds rushed back up the hillside, once again enveloping us and the view in its blanket of white until dissipating into weak, disorganized tendrils. This frenzied peep show repeated for perhaps thirty minutes before the fog scooted further along the valley, leaving only a clear view with puffs of clouds tangled in mountain crags. We awoke to a drenching downpour on the third day. No matter, because we headed into the canyon. The rain swelled the river into a raging torrent and invigorated the waterfalls plunging hundreds of feet down the canyon's vertical stone walls. The ferns and moss in the dark, dank recesses of the gorge became greener and more vibrant as they soaked in the rain. The legend of a tiger escaping a hunter's capture by jumping across the gorge has become the region's namesake. There is now a famous viewpoint on the rock where the tiger allegedly performed its memorable feat. Analyzing the 90 foot distance and considering that the Jinsha River could be more tranquil and lower in a dry season, the legend is believable! There are two ways out of the canyon. An enterprising family has rigged a ladder from the river up to the road where most hikers catch the bus to Lijiang or Shangri La. The daughter stands at a gate blocking the trail, persuading people that the ladder is safer and faster. She has her hand out for the 15 yuan the family charges to climb the ladder. She speaks only Chinese and the scene appears as if that is the only way out. In the dark corner of this gate area, a government sign explains that hikers can continue along the base of the river on a well-maintained trail for free. The trail then ascends the canyon to the road and bus depot above. We chose to continue along the trail and found it incredible, with some of the best views of the day, including the glass platform that juts out over the gorge. It took us 1.5 hours to climb out of the canyon to the bus depot (not three hours, as the daughter told us). Hiking Tiger Leaping Gorge was not difficult. There were a few strenuous sections, but overall it was scenic, relaxed and fun. There are plenty of resources along the trail to ensure comfort and minimize the load you need to carry. We did discover that the area is changing fast and many of the travel blogs that we relied on for information have become a bit dated and are perhaps a teensy exaggerated. 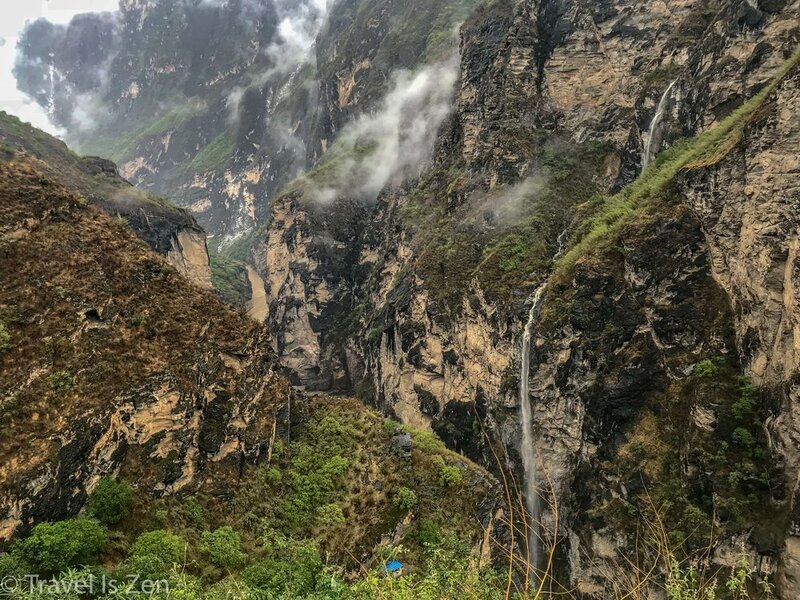 We've outlined a few of the surprises that we had during our three day trek in the post "The Truth About Hiking Tiger Leaping Gorge in 2018".